Flamelike Candles 7” Flameless Candle - LED Dripless Flickering Fake Candle for Indoors & Outdoors - Non-Wax Odorless Pillar Candles with Timer Function & Battery Operated. 3.5 x 7” Ivory. ●Programmable timer functions to use as a discreet nightlight for your children or to light up your hallway as you come home from a long day at work. Our flameless artificial candle will automatically shut off after 5 hours of use with the timer. ●Forget to blow your candle out? No need to worry about that anymore when using a realistic non-wax flameless resin candle. Leaving a candle burning can cause a real danger but with our flameless LED flickering candle, that danger disappears. ✔ HIGH-QUALITY RESIN FLAMELESS CANDLE: Our flameless pillar candles are specifically designed and formulated to look and feel like a real wax candle. Unlike a real candle, you don't have to worry about our flameless candle dripping wax and making a mess, cracking or breaking like a real candle. ✔LED 7" FLICKERING FLAME: Our 7" flameless resin candles create the illusion of a real candle without the real flame. We use a powerful LED bulb that flickers like a real flame would to create a relaxing and calming ambience in your home. All powered by an advanced LED light bulb and 2 D batteries that will give you 600 hours of battery life. 200 Hours longer than any other flameless LED candle on the market. ✔SAFE TIMER FUNCTION: No more wondering if you left a candle burning at home when you are out, or risk burning your house down with a real flame wax candle. 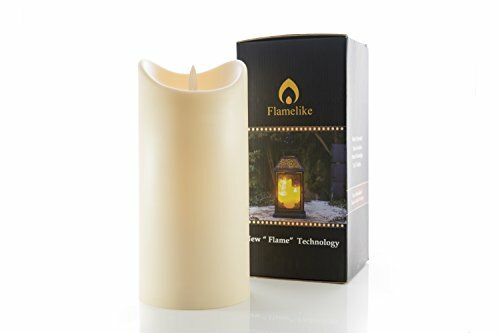 Flamelike Candles Flameless Candle features a timer function to have it turn on for whatever time you'd like. The candle will then stay on for 5 hours and automatically shut off for 19 hours and then repeat that cycle until you turn it off. Perfect for if you want a light to come on when you are away from home. ✔UNSCENTED, SMOKELESS & NO MESS CANDLE: Our flameless resin pillar candles for indoor and outdoor use are unscented which is great for people with sensitive senses or allergies. No nasty black smoke to leave burn marks or soot. Best of all, the flameless resin candle will not melt and leave annoying wax drippings on your furniture. Real wax candle look without the wax candle mess. ✔WE STAND BY OUR FLAMELESS CANDLES- We guarantee that you'll love them 100% or we will refund your money. Just email us 24/7. We are happy to assist. Our candles are safe to use anywhere indoors/ outdoors, as a window candle, in a lantern, wedding centerpiece, church, memorial vigil, Christmas lights. Candle specifications: Ivory, Pillar, Real Wax, Battery Operated, 3.5 x 7"
If you have any questions about this product by Flamelike candles, contact us by completing and submitting the form below. If you are looking for a specif part number, please include it with your message.